Chocolate Almond Butter Fat Bombs - the perfect easy snack full of healthy fats and protein! 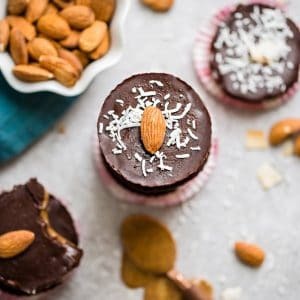 Best of all, this recipe is made with only 4 ingredients and is gluten-free, paleo, keto, low carb, Whole30-friendly, and vegan. Heat almond butter, coconut butter & coconut oil over a double boiler (or microwave) and stir until smooth. Remove from heat & stir in MCT oil, sweetener (if using) and salt until smooth. Adjust sweetener according to taste. Divide the nut butter mixture evenly into each muffin cup with a spoon. Tap the pan on the counter to smooth out layer. Freeze for 15 minutes or until firm. Meanwhile, heat coconut butter & coconut oil over a double boiler (or microwave) and stir until smooth. Whisk in cacao powder (& sweetener if using) until smooth. Remove muffin pan from freezer and spoon chocolate layer evenly over each nut butter layer - tap pan on counter to smooth out layer. Place pecan halfs on top (if using). Freeze again for 30 minutes or until firm. Enjoy immediately or store in zip-top bags or airtight container in freezer until ready to enjoy. For a softer texture, remove from freezer and allow to sit at room temperature for 1-2 minutes.